A full re-score confirms Border’s runs and the sequence of strokes, yet the balls faced figures as published seem to be quite wrong. Border is given 314 balls for his 98* and 269 for the 100*. The figures I get are 283 and 285 balls, respectively. Viv Richards’ figures for his 76 are also very doubtful: I get 130 balls not 188. There are other discrepancies. Using the revised figures, the balls faced now reconcile with the bowling figures. I had never thought to compare the balls faced with the total overs in an innings. I was surprised to find that substantial disagreements are quite common. Some discrepancies are to be expected – a single off a no-ball used to be an extra ball but not a sundry; many wides can come from one ball; a wide used to be counted as a ball faced in Australia; there have been plenty of 5- and 7-ball overs which won't show up in the team totals. But still. Below is a list of innings where the discrepancy is at least 20 balls. It's enormous. I've defined "discrepancy" as the sum of the balls faced, minus the total number of balls in the innings, minus the extras. I had originally planned to manually check all of these anomalies, but I couldn't be bothered. I've made notes on a few of the more egregious cases. I didn't output the dates of the Tests when making this table. The quickest way to pull up the scorecard is probably via CricketArchive's Scorecard Oracle. To bring up Test 104, enter t104 as the 'match id'. The Test that Davis talked about is t983 – you can see that all three innings of that match are on the list, as are two innings from the fourth Test of that series. 703       India          England            1     458        508    0    0          50 Minutes make sense. 708       India          England            3     522        636    3    0         117 Minutes make sense. faced a lot more. Old too? 1010      New Zealand    Pakistan           2    1002        882    6    0         114 Probably Wright faced a lot less. 1058      Pakistan       West Indies        2     566        661    2    1          98 Rameez faced much more. 1163      Australia      England            1     509        400    5    1         103 Atherton faced much less. 1180      Australia      India              2     836        732   11    0          93 Probably Jones faced much less. 1232      Sri Lanka      South Africa       4     592        672   15    1          96 Probably Rhodes faced much more. Kartikeya Date has written a post applying the h-index, originally designed as a measure of academics' research impact, to batsmen. The basic idea isn't original (see, e.g., this blog post with a related h-based stat; that post also cites a paper by Gangan Prathap which I can't read because it costs 35 euros to download), but Kartikeya's implementation seems to be novel. The definition of h-index is this: it is the largest integer h such that the batsman has made h scores of at least h. Combining Test and ODI cricket, Sachin Tendulkar has an h-index of 100, since he's made 100 scores of at least 100. 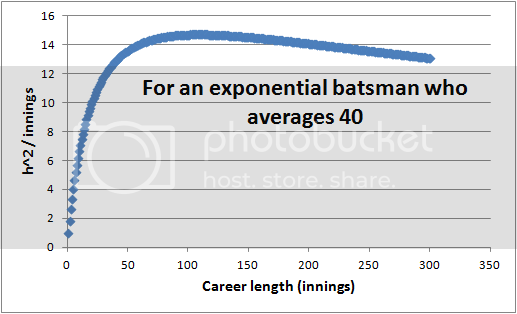 Kartikeya correctly notes that a batsman's h-index will tend to rise over the course of his career, and it can never decrease – if after 30 innings, he has 12 scores of at least 12, then he will never again have less than 12 scores of at least 12. The question then arises as to how to normalise the h-index, and Kartikeya proposes h^2 / innings, which "is a measure of consistency and quality without either privileging or penalizing a player for length of career". I was initially very sceptical that such a normalisation could work. But it does, somehow. I'll split this post into two parts: in the first, I'll talk about why h^2 / innings is a decent metric over a range of different career lengths; in the second, I'll describe what I would do with an h-index, and show that my method doesn't give much (if any) improvement on h^2 / innings. 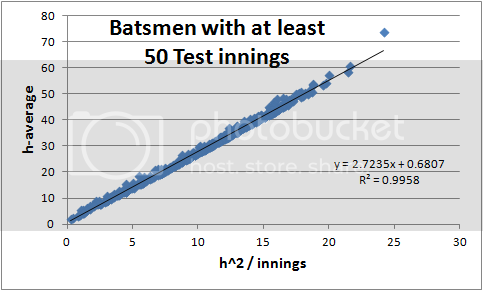 For ease of doing the maths, let's assume that a batsman's scores are exponentially distributed, so that the probability of a score greater than n is exp(-n / avg). This assumption is not particularly good for low scores, but it'll do for now. N * exp(-h / avg) = h.
That is remarkably close to a straight line. I don't know whether there's a good mathematical reason why it should be so close to linear, or whether it's just a coincidence. 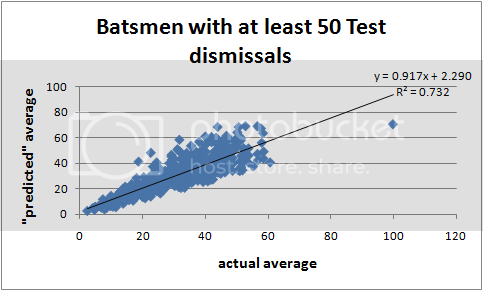 In any case, it shows that dividing h^2 by the number of innings will give you something roughly constant over a career, assuming an idealised batsman with constant ability. There are two points to make here. 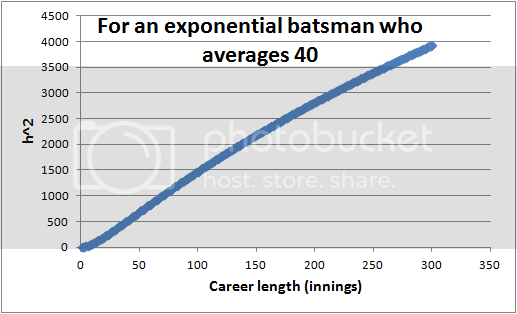 The first is that for career lengths between about 50 innings and 300 innings, h^2 / innings doesn't vary too much: its maximum in this case is at about 14.7, its minimum over that range about 13. The second point is that this level of variability may be undesirable. An increase of 1.5 in h^2 / innings could send someone from being ranked 50th all-time to being ranked 23rd. avg = h / ln(N/h). Essentially, then, for a given number of innings N, we are associating an h-index with some sort of effective average, which I'll call an h-average (it won't be defined if h = N). I think it's useful to do this, because the h-average is on the same scale as the regular average, which we're all familiar with. An h-average of 50 is very high; Chris Martin has an h-average of 1.8 (or at least he did whenever I last updated my database, in December 2010). A table of h- and regular averages is at the end of this post. The wild non-Bradman outlier on the first plot is Jesse Ryder, who at the time of my last database update had an h-index of 20 after just 25 innings. In the second scatterplot, you can see that his (and a bunch of other high-h-average players) h^2 / innings is suppressed because of his low number of innings. 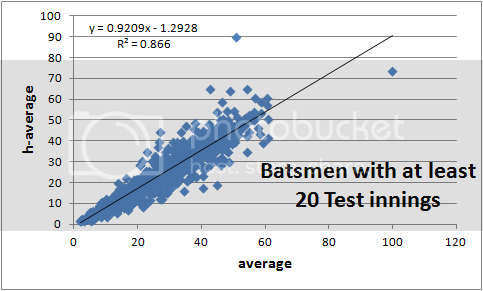 But correlations are quite good – given a player's average, his h-average doesn't tell you that much extra information about his batting, and vice versa. I don't think I have a strong conclusion. The h-index rewards consistent scoring, and while consistency may be useful, I'm not sure that it's better or worse than scoring the same amount of total runs but with less consistency. Anyway, here is a nice big table. 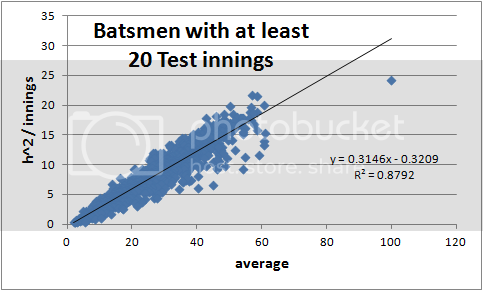 Qualification of 50 Test innings; stats current to late 2010.